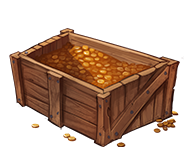 You may purchase Ranks, In-Game Money/Shards and Unique Items. You may also earn credits to use on the store during in-game play to spend here. The Top Voters every month will be awarded with credits that will be redeemable for goods. Note: Advertised sale prices are estimated with included complimentary coupon code "HC10". You must enter the coupon code at check out to receive the full discounted rate listed above. All payments are processed by PayPal. You may still use a credit and or debit card through PayPal without having a PayPal account. If you require an alternative way to purchase an item, please contact an administrator on our forums. Please note that all donations made to HarvestCraft are final. You may not refund, charge-back or by any other means debate a purchase. If you attempt to charge-back to the server BuyCraft (Tebex) will automatically ban you from our server, and all other buycraft pages. Please also note, HarvestCraft is not affiliated with Mojang or any of it's counterparts. We simply run a server through the game Minecraft. Thus, do not hold them responsible for any failures or issues you may have while playing on our network. If you need any support, please contact an Administrator on our forums at www.harvestmc.net. Every $65.00 donated, everyone online player gets 1 Mythical Key!